Tarragon is a popular perennial herb commonly used in French and English cooking. There are different varieties of tarragon but each is a member of the Compositae or Asteraceae (sunflower) family and has a distinctive licorice, lemon, and basil flavor. French tarragon (Artemisia dracunculus) is most commonly used in cooking. Russian tarragon (Artemisia dracunculoides) is a hardier plant and has a flavor that many describe as bitter. Mexican tarragon, also called Mexican marigold mint or Spanish tarragon, is similar to French tarragon with a slightly more licorice-y taste. While tarragon is most commonly used for cooking, some manufacturers use tarragon to add scent to soap and cosmetics. It can also be used for medicinal purposes. French tarragon, also known as Estragon, is sometimes used to treat digestive disorders or toothaches. Some use it to reduce water weight or stimulate the appetite. It is also sometimes used by women to promote menstruation. But there is no strong evidence to support the use of tarragon for any of these benefits. Tarragon may have potential as an anti-nausea treatment after surgery. One clinical trial demonstrated that people treated with an herbal combination that included tarragon were less likely to experience nausea and vomiting after surgery. But it is unclear whether tarragon alone can provide this benefit. Researchers are also conducting studies to see if Russian tarragon may help in the prevention or management of diabetes. Preliminary studies are also investigating the role that Russian tarragon may have on exercise performance. 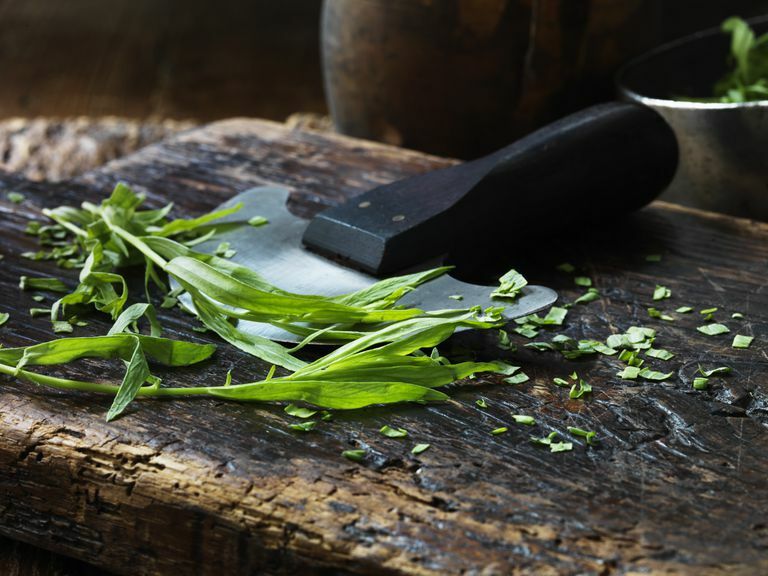 Two tablespoons of fresh, raw tarragon provide only about 5 calories. A serving of the fresh herb will not provide significant carbohydrate, protein or fat. One tablespoon of ground tarragon contains about 14 calories, 1 gram of protein, less than 1 gram of fat, and about 2.5 grams of carbohydrate. Vitamins in tarragon include vitamin A (4 percent of your recommended daily intake), vitamin C (4 percent), vitamin b6 (6 percent), and folate (3 percent). Minerals in tarragon include calcium (54 mg), iron (1.5 mg), magnesium (16.5 mg), phosphorus (14.9 mg), potassium (143 mg) and small amounts of sodium, zinc, manganese, and selenium. The mild fresh taste of tarragon pairs well with chicken, fish, and egg dishes. You'll find fresh tarragon in the produce section of most grocery stores. Look for bright green leaves with few or no brown spots. When you get it home, wrap it loosely in a paper towel and store in the refrigerator until you are ready to use it. Dried tarragon leaves or ground tarragon can be found in the spice aisle of the market. Like all spices, it should be stored in a cool, dry, cupboard. When you use tarragon, add it to the recipe at the last minute to take full advantage of the herb's flavor. Tarragon is likely safe when consumed in amounts typically found in food. If it is used medicinally for the short-term, it is also likely to be safe. However, long-term use may not be safe. Tarragon contains chemicals (estragole and methyl eugenol) that have demonstrated toxicity in mice. However, according to one published report, "no acute toxicity or mutagenic activity has been reported at doses relevant for human consumption." Still, health experts advise caution when considering the use of tarragon as medicine for the long-term. Certain populations should avoid tarragon until speaking to a health care provider, including pregnant and breastfeeding women, patients with a bleeding disorder, those with an allergy to ragweed, and anyone undergoing surgery within two weeks. Yes, although the texture of tarragon may change when you freeze it. There are different methods that cooks use to freeze this herb. You can chop tarragon and place it into the sections of an ice cube tray, then fill with water to freeze. Or you can place tarragon in a baggie and remove extra air so that it is vacuum sealed. ﻿What is a suitable tarragon substitute in recipes? Dill and basil are the two most common recommended tarragon substitutes in recipes. Some cooks also use fennel seed or anise as a substitute for dried tarragon. Tarragon Full Monograph. Natural Medicines Comprehensive Database. 08/15/2018. de Pradier E. A trial of a mixture of three essential oils in the treatment of postoperative nausea and vomiting. International Journal of Aromatherapy 2006;16(1):15-20. DOI: 10.1016/j.ijat.2006.01.004. Pischel, I., Burkard, N., Kauschka, M., Butterweck, V., & Bloomer, R. J. (2011). Potential application of Russian Tarragon (Artemisia dracunculus L.) in health and sports. Journal of the International Society of Sports Nutrition, 8(Suppl 1), P16. DOI: 10.1186/1550-2783-8-S1-P16. Jäger, R., Kendrick, I. P., Purpura, M., Harris, R. C., Ribnicky, D. M., & Pischel, I. (2008). The effect of Russian Tarragon (artemisia dracunculus L.) on the plasma creatine concentration with creatine monohydrate administration. Journal of the International Society of Sports Nutrition, 5(Suppl 1), P4. DOI: 10.1186/1550-2783-5-S1-P4. Oliver, J. M., Jagim, A. R., Pischel, I., Jäger, R., Purpura, M., Sanchez, A., Fluckey, J., Riechman, S., Greenwood, M., Kelly, K., Meininger, C., Rasmussen, C., … Kreider, R. B. (2014). Effects of short-term ingestion of Russian Tarragon prior to creatine monohydrate supplementation on whole body and muscle creatine retention and anaerobic sprint capacity: a preliminary investigation. Journal of the International Society of Sports Nutrition, 11(1), 6. DOI: 10.1186/1550-2783-11-6. Obolskiy D, Pischel I, Feistel B, Glotov N, Heinrich M. Artemisia dracunculus L. (tarragon): a critical review of its traditional use, chemical composition, pharmacology, and safety. J Agric Food Chem. 2011;59(21):11367-84. DOI: 10.1021/jf202277w.